Credit must be given to Lenovo for helping to move the All-in-One market forward. This design makes a lot of sense and future iterations will make IT departments very happy. But the monitor is boring and years behind display innovation. When you think of All-in-One PCs you typically envision ugly, hulking machines that look more like furnaces than computers. However, the All-in-One market has matured in recent years and manufacturers are innovating to make them sexier, smaller and more affordable. All-in-Ones like Lenovo's IdeaCentre Horizon Table PC and HP's Z1 G2 have elevated the field, forcing brands to think outside the box for innovation. In comes Lenovo. Lenovo's ThinkCentre Tiny-in-One 23 (starting at $349, £221, AU$400) is a no-frills All-in-One 23-inch PC monitor that gives businesses the ability to swap in and swap out Lenovo ThinkCentre Tiny PCs without much hassle. The Tiny-in-One sports a full HD screen at 1920 X 1080 resolution and four USB ports, including two that are front-facing. The Tiny-in-One is built with a Sandwich VESA mount that enables quick and simple PC replacement. 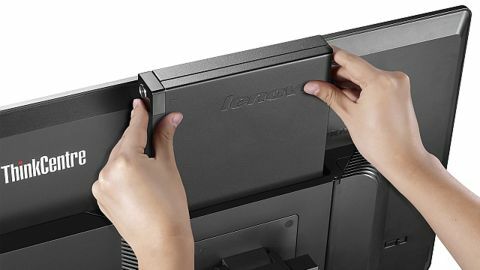 Within one minute, I was able to open a side latch, undo the three-way port connector that attached the PC to the monitor and then push the PC out of the VESA slot. This design makes it much easier and more affordable to replace an entire All-in-One PC fleet when you decide to upgrade under the hood. Additionally, IT can more easily move employee desks, and workers can take their work computer wherever they go (so long as Tiny-in-One monitors await them when they arrive). If you enjoy having multiple displays you'll enjoy being able to use the Tiny's inputs to go multi-screen. You can use the monitor to present three separate displays (four if you're in Mosaic). And because the monitor runs Energy Star certified, you'll use only 90 watts on 87% power supply. If you're worried about how easy it is for thieves to pop out a Tiny PC from the monitor, don't fret: a Kensington, Smart USB or Bluetooth lock can secure both the monitor and the PC.